HADAS DIARY – Forthcoming Lectures and Events. Tuesday 8th April 2014: House Mill and its Restoration. Lecture by Brian James-Strong and Beverley Charters of the River Lea Tidal Mill Trust. Lea Valley, the setting for London’s Industrial Revolution. He will explain the activities of the River Lea Tidal Mill Trust to date, including the restoration of the fabric of the House Mill, and give details of building of the contemporary adjacent Miller’s House, which currently serves as a visitor and education centre. He will touch on the distilling industry, and the part that Three Mills played in this over its 200 years of operation. He will also discuss the special significance of some of the remaining milling machinery, in particular, the Fairbairn-style millstones. Beverley will provide an overview of the Trust’s current plans for the next stage of restoration. “Saving the largest tide mill in the world!” This will include the heritage machinery (four wheels, two sets of grinding stones and the sack hoist), exhibition and interpretation throughout the buildings, and improved visitor and education facilities; she will bring us up to date on the fundraising campaign, which includes an imminent Round 2 application to the Heritage Lottery Fund. On 10th and 11th May there will be the National Mills Weekend at the House Mill. For details see “Other societies’ events” at the end of this Newsletter. Thursday, 15th May 2014 Outing to Portsmouth on to see the new Mary Rose Museum, HMS Victory, HMS Warrior and the Royal Navy Museum. Cost is £40 per person. We need to make firm bookings of both the coach and the dockyard but do not yet have quite enough participants to make this viable. So do what you have been meaning to do and book. Why not bring a friend? It should be a great day out! Sunday June 29th to Thursday July 3rd, Long Outing to Kent. Lots of members are coming on this, but there is still room for a few more. So if you have not yet booked, do not hesitate to get in touch with Jim Nelhams (contact details at the end of this Newsletter). Tuesday 11th November 2014 – TO BE CONFIRMED. Over recent years, we have met at Avenue House (now Stephens House) for a social gathering. This has proved very successful, and well worth repeating. Please note in your diaries that we have booked the Drawing Room, where we have our lectures, for Sunday 7th December. Details will be circulated in due course. The Mill Hill Archaeological Study Society is running a course of six classes with this title. The course will examine the archaeology of the first of the native peoples into Australia. We will investigate theories regarding the entry and date and which human species first entered the new lands of Australia. We will study the arrival of the first people into Australia about 50,000 years ago through both archaeology and aboriginal oral traditions. We will examine how these first people adapted to their new environment and how their art and material culture developed. Specific topics include rock art and the extinction of the megafauna. The course tutor is Scott McCracken. The course is on Friday mornings from 10 to 12, beginning 4th April, in the Eversfield Centre, 11 Eversfield Gardens, Mill Hill, NW7 2AE. The cost for the course will be £45. Enrol at the first meeting; if you have not previously attended the Society’s meetings please contact the secretary, Peter Nicholson (020-8959 4757). “My father attended Woodhouse School in its early years. I’d like to obtain a copy of Percy Reboul’s book ‘By Word and Deed: A Chronicle of Woodhouse School 1922 – 1949’. I’m wondering if you could suggest how I might obtain a copy? Percy told me he doesn’t have a spare copy but that I should keep trying the usual book sources. But I’ve had no success. Of course I’m happy to pay for it. Can anybody help him? Please let Don Cooper know if you can (contact details at the end of this newsletter). Nothing beats a talk by the expert on site at a dig; thank you, Ian Blair (Senior MOLA Archaeologist) for a fascinating talk. The site was found during a road-widening scheme. The burial took place 1,400 years ago. The Prittle Brook runs nearby, and the site aligns precisely with Southend pier, being on an E – W alignment. Prittlewell is in the same league as Sutton Hoo. There are far more imports found here than at the Taplow burial; and the chamber area is bigger. Sutton Hoo is an exception because it is in a ship. The only named king likely for the burial is Saebert (d. 616), king of the East Saxons and the first to convert to Christianity. This theme is reinforced by a gold cross being laid over each eye. There is a lamp-stand placed on the foot-end of the ghostly soil stain of the coffin (probably closed alight). There was a lot of cloth; the chamber was probably draped with very bright cloths. The tomb and its contents were buried within an oak board compartment. Organic preservation was very, very poor due to an (acid) sand context. Most enthrallingly, artefacts were found to be on their original hooks, having been hung against the walls – artefacts such as a flagon, stunning glass jars, a folding “campaign” stool, and a gold buckle which was beautiful, impractical, and not quite finished to the exacting standards of the Sutton Hoo one: the back-plate was not a true fit. The 57 gaming pieces turned out to be of marine provenance, with an antler dice. Also found were two gold coins, and gold brocade for a tunic’s shoulder. The lines of the 3.5m chamber are its only remains and the ghost of its inner walls is indicated by the hanging objects. Members will remember that HADAS excavated at Hendon School in 2012 (see newsletter no 498 September 2012). One of the items we found was a flash drive which presumably been lost and eventually stamped into the ground. It was bashed and covered in mud. After it was cleaned and washed we were able to read it. Gabe Moshenska of UCL has created this comic strip to illustrate what we found. Here is the final report from our Buxton trip last year. We hope you have enjoyed the articles submitted regarding our trip to Buxton. We had contributions from 18 members: our thanks to them all. And the trip encouraged further research – hence the contribution from Emma Robinson. 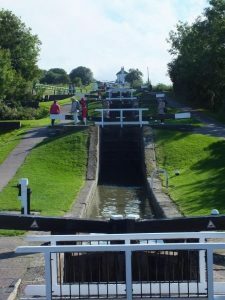 By the time we reached Foxton Locks on a stretch of canal built to link the Birmingham and Leicester branches of what is now the Grand Union Canal, the weather had taken a marked turn for the better. As we walked to the locks along the towpath the tranquillity of the setting belied the reality of the mercantile and industrial nature of the canal network. These were the watery superhighways of the industrial revolution – never meant for the leisure pursuits and peaceful reflections of weekend walkers and boaters. A bend in the canal brought us to the top of the ten locks. Started in 1810 and finished four years later, these are arranged in two flights of five, with a holding pool halfway up that allowed boats to pass. Foxton is the largest flight of staircase locks on the English canal system and rises 22m (75ft) from top to bottom. Foxton was built to the narrowboat width of 2.1m (7ft) rather than the barge width of 4.2m (14ft) partly due to the lack of water available. Originally the pounds alongside the locks for containing the water during opening & closing were larger, but the construction of the Inclined Plane boat lift truncated their area. With increasing use of the canal system throughout the 19th Century, the narrowness of the locks coupled with the time taken to negotiate the flight (about 45 minutes) presented a substantial problem. An alternative solution was presented in the form of the Inclined Plane boat lift. Inclined planes were already in use that required the cargo to be unloaded into trucks that were then raised and lowered on tracks. An example is the Hay Incline built in 1790. Experiments had been made using water tanks to contain the boats at Bulbourne. When the Foxton Inclined Plane was built, it represented the pinnacle of such technology in this country. The barges were floated into large water filled, counter-balanced caissons and transported to the top or bottom of the incline using a steam pump. This system was capable of raising 2 loaded barges and lowering 2 loaded barges at the same time. There was no need to unload cargo into narrowboats in order to negotiate the locks so wide boats could be used for the whole journey. In addition it took around 12 minutes using the Inclined Plane, a substantial saving in time. The Inclined Plane took 2 years to construct and came into use in 1900. The pump house, now the museum, had been completed in 1897. Foxton locks fell out of use somewhat due to the success of the Inclined Plane. However, the development of the road network was beginning to move cargo away from the canals. The locks were refurbished in 1909 to allow for night use, and in 1911 the lift was closed to save money. During the First World War it was kept in reserve in case it was needed for the war effort. Finally, in 1927, it was scrapped and the locks received a major refurbishment at the same time. 1929 saw the formation of the Grand Union Canal Company with pleasure grounds and sea-going ships. Subsequently there was some effort on the part of the government to improve the canal system. Nationalisation in 1948 meant a re-categorisation for the waterways into Freight use, Cruiseways and Remainder. Fortunately this section was classed as Cruiseway and so effort was put into keeping it working. Subsequently major work has been carried out by volunteers and the area is attractive spot not just for those afloat but also for visitors who prefer terra firma. Jon and I visited the tiny Bridge 61 pub with its lovely homemade Scotch Eggs and Foxton Locks & Inclined Plane beers served from a bar that looked like a domestic serving hatch. A very pleasant end to an interesting trip. Our visit to Bakewell was memorable at a number of levels but I was particularly pleased to visit the Saxon High Cross (dated to the 10th century or earlier) in the churchyard of All Saints Church. This church was founded in the early 10th century and probably after the Bakewell Cross was carved. Much more could be said of the collection of 37 pieces of Anglo Saxon or Anglo Scandinavian sculpture now in or around All Saints Church – including the shaft of a second cross. Some fragments were found during restoration work in the 1840s – whilst others were found or dug up in the locality. Overall the collection forms part of one of the largest survivals of carved stonework of this period in the country – although much more still needs to be discovered about their history. It is a legend relating to the origins of the Bakewell Cross, however, that particularly interests me. Local tradition has it that the cross originally stood at the Hassop Cross Roads (OS grid ref. SK223722) and it was subsequently moved to the churchyard. An HLF funded project testing this tradition is underway and forms part of a project being undertaken by Archaeological Research Services Ltd, the Parochial Church Council of Bakewell Church and the Bakewell and District Historical Society. English Heritage, however, only allowed ‘keyhole surgery’ around the foundations of the Cross’ current location. But the findings were remarkable in that the cross base was found to be resting on the foundations of an ancient wall … and further under this wall was a skeleton from which a tiny fragment was successfully carbon dated to the 11th century. So since the cross predates the skeleton it must have been moved from its original position. But where was this? Explorations of the cross base revealed a gap into which a boulder has been concreted. The origins or purpose of this gap cannot be confirmed with any certainty – but it might be helpful in detection work? The focus of the research now moved to the Hassop Cross Roads and investigations of the Longstone Enclosure Map (the name in itself is a clue). In summary, the enclosure map was superimposed on an aerial photograph of topographical remains in the field and the location of the site of the ancient cross roads determined. Following magnetometer surveys sufficient evidence was gathered to justify that the ancient track-ways identified could well be those of the legend and digging commenced. It was certainly “Archaeology for All” with groups of all ages from school children to Bakewell U3A members involved. Many generations of ancient tracks were revealed. Finds indicated that they had been through routes from possibly as early as the Mesolithic period – although used more heavily at some periods. A stone mound was found at the cross roads which could have been the previous support structure of the cross base. The mound has a stone foundation at the right depth and a jumble of roughly squared stones which look remarkably similar to the stone foundations of the cross found in the church yard. However, as the Journal of the Bakewell & District Historical Society  records “… lack of time and heavy rain prevented further excavation”. It is so often thus! Stetka, J., 2013. Chairman’s Report, Journal of the Bakewell & District Historical Society. pp. 5-13. Following a successful interim HLF Grant application for restoring the gardens, work has begun on identifying various structures on the estate. One such structure is the Water Tower which appears to be closely connected with a now demolished substantial laundry/hothouse building. The Tower, which is listed, has a colony of Pipistrelle bats – a protected species. Currently the Tower has no apparent ground floor entrance. H.C. Stephens (of Stephens Ink) bought the existing Villa of Avenue House including the adjoining Little Church Field in 1874. This field and the garden of the Villa were then landscaped by a famous gardener called Robert Marnock, “who was said to be the best landscape gardener of his time”. Later Stephens bought the Great Tapes field to the east of the estate. About this period the Water Tower (1880), Laundry, Bothy and water management system were built. The Bothy is said to be one of the earliest buildings constructed of reinforced concrete. “At this time the principal approach to Avenue House was laid out, a long straight drive along the southern boundary with an entrance on Manor Way and probably a second entrance from East End Road. This approach underlined the importance of the garden elevation at the front of the house; carriages arriving by the long southern drive would arrive at the terrace on the garden side. After passing through Great Tapes Field (now the sports ground east of Avenue House grounds), the Bothy would have been the first structure that visitors would have seen entering the estate via the drive. The initial view of the carriageway would have been of the east facade (the main accommodation and courtyards); as the carriage progressed the view would have been the south elevation, the side wall of the accommodation and looped iron fence and gates of the garden (in place of the 4m high walls elsewhere). This view would have allowed direct views into the Bothy garden and the impressive arrangement of glasshouses and palmhouses etc. The setting of the Bothy, slightly elevated above the carriageway by a few metres, would have dramatically enhanced its appearance. This would have been followed by views of the water tower and additional hot houses on the southern side of the drive”. (Extract from Avenue House’s draft Conservation Management Plan 2013). The management of Avenue House asked HADAS to investigate a possible entrance in the ground on the north side of the Tower. It was proposed to clear an approximate 5m x 5m area by hand; within this area there is a possible indentation which may have indicated such an entrance to a basement level. An initial investigation began early November 2013. “In February and November 1879 Stephens wrote two letters regarding the hardness of the water that he was being supplied with. On 22nd November he stated in a letter to Messrs Atkins & Co. of Fleet Street ‘A water tower of so great a height would be rather objectionable. Can I not receive the water into a tank and softening apparatus on grounds and after softening pump it into a 2000 gall cistern just high enough for house once a day for supply by gravitation to house cisterns?’ The Water Tower was built the following year. The tower is 9m high and features three separate compartments for storing water”. (Review of Water Engineering at Avenue House by Marcus White, Nov 2013). On the NE side of the tower a series of pipes rise on the outside of the tower supplying water to/from each of the three stages. The pipes are clad in wooden shuttering (this shuttering can be seen entering the different stages of the tower) and are thought to be a later modification and partly, if not wholly, connect to those in the excavated ‘valve pit’. The same review states that the use of the tower is not yet fully understood e.g. whether the tower was actually used for water softening; did it supply just the laundry or the rest of the house and gardens? Much of the pipework is not original being ‘an afterthought or modification’. Trench 1 was placed 1.50m directly north of the tower base; it measured 1.80m EW x 1.50m NS. There was an existing ‘opening’ in this area; it had been suggested that this was an opening to a basement room of the tower or access to a plant or pump room. On cleaning the top of the opening it was found that a rough concrete slab had been laid over the area, and within this was a frame made of bent metal piping to fashion a handmade manhole cover. The cover had subsequently been lost leaving an open hole that had silted-up. Excavation began of the silty fill; this was a light-brown organic, leafy/silty material [context 003], and judging by the relatively modern sweet wrappers etc the fill had accumulated over the last few years. • An EW foul sewer pipe along the south edge of the trench (86.00 OD)  A series of 3 smaller < 8cm iron water pipes running EW. • A (?) distribution pipe running (86.19 OD) NS to/from the tower and exiting north from the chamber.A junction takes the same feed eastwards and westwards exiting the walls of the chamber. These pipes have square ‘key’ controlled valves. A further two smaller diameter pipes < 4cm came off the feed pipe controlled with keys and taps and may be ‘sampling’ pipes. • Another 3 smaller diameter pipes crossed the chamber with keys and taps; many of these smaller iron pipes centred over a sump cut approximately in the middle of the chamber floor. Three ceramic drain pipes fed into the chamber, one from the north, one from the SE and one from the west. • A cast-iron pipe crossed the trench and chamber from SW to NE (86.25 OD). This cut across the rough western wall. Beyond the western wall was a disturbed context of mixed brown/yellow sand/silt with a mortar/rubble feel. This was a much disturbed context from the works around the chamber and the continued work and replacement of the pipe system. Finds [layer 003 fill of the valve pit]Metal 2 x circular metal (valve) tags 38mm diameter, one with ‘E’ stamped on it, small amount of iron strapping, small amount of thin lead sheeting – used as partitioning on the western side of the pit wall.Building material Small amounts of slate and a sherd of field drain pipe.BoneLarge (cattle?) bone, joint end, butchered with straight clean cut across the bone. Small chicken type leg bone.Miscellaneous A selection of modern plastic, metal and rubber finds. [layer 004 western side of the trench, outside the valve pit] Pot Single sherds of Redware (flowerpot), Refined Whiteware, Tin-glazed Ware (plate rim) 1800-1900.Building materialSmall amounts of brick & slate fragments, clinker, white-glazed brick fragment. MetalAn amount of corroded nails, cast-iron fragments, thin lead sheeting (used as a partition on the west wall of the valve-pit). Clay pipe A stem to bowl fragment, stamped ‘BENNEVIS’ on the stem. Clay pipes stamped with 'Ben Nevis' are known as cutty pipes (short stem pipes). They were made by a great many pipe makers and were very popular up to the beginning of the 20th century, but seem to have stopped being made after the Second World War. They were exported all over the world. Cutty pipes were made for manual workers so they could hold them in their mouths while using their hands. The pipes were sometimes called 'nose warmers' and in Ireland called 'Dudheen'. Cutty is Scottish slang for short. (D. Cooper – personal comm.). Glass Several fragments of clear modern vessel glass. DiscussionTrench 1 appears to be placed over an inspection/valve pit and drainage chamber controlling the flow of water to and from the tower (not yet fully understood) with other pipes passing through. Pipes head west towards a building variously described as a laundry or hot-house. The jerry-built cover, north modern brick wall and brick/mortar west wall, seem to infer the 'chamber' has been rebuilt and modified over the years with the insertion/repair of various pipes and plumbing. Wooden shuttering attached to the NE side of the tower covered a similar series of pipes/keys/taps running from the ground vertically up to various stages in the tower.Further work is proposed to try and establish what lies outside the 'valve-pit', an entrance lobby to the laundry/hothouse is known from maps. Other work is needed to sort out how big the laundry and ancillary buildings were, and how this relates to an adjacent 'glasshouse/hothouse' mentioned in documents and seen on maps (for Trench 2 see Newsletter 514 Jan 2014 p5). References: Review of Water Engineering at Avenue House by Marcus White, Nov 2013.Avenue House, Draft Conservation Management Plan 2013. The Godfrey Edition, Old Ordnance Survey Maps, Finchley 1896. Laundry – What Laundry? Don Cooper, HADAS Newsletter No. 514, Jan 2014 Martin School Bill Bass HADAS members had a brief inspection of a gas pipeline being laid across the playing field in conjunction with the new works at the school where we found an air-raid shelter last year. The pipe had been laid and turf kicked in but we got a fair idea of what was going on. The pipeline which ran from the 'field' classroom to the High Road was about 30-40cm wide by 7080cm deep. It showed the make-up being the usual 40cm ish of topsoil over natural clay. We found several spots where the pipe had cut the (1913) field drain system and evidence of other types of field drains (possibly earlier than the one we are familiar with). Finds included pot and metal, also a heavily worn 1902 penny and a possible utensil bone handle. In the area of the air-raid shelter were familiar spreads of brick rubble probably clipped off a wall below. We hope to continue excavation this summer to pinpoint the shelter entrance. Exhibition and Book Enfield Archaeological Society in collaboration with Enfield Museum Service are producing a greatly enlarged and lavishly illustrated new edition of the late Geoffrey Gillam’s grounding breaking work “Enfield at War: 1914-1918” originally published in 1982. The new edition is written and edited by Ian K Jones. The book is being issued to coincide with a major exhibition at the Dugdale Centre, Thomas Hardy House, London Rd, Enfield, Middlesex EN2 6DS on “Enfield 19141918” to commemorate the beginning of the First World War. The exhibition will run from late March 2014 to January 2015. The book can be ordered from Ian K Jones, 18 Corby Cresent, Enfield, Middlesex EN2 7JT. The book costs £15.00 plus £3.30 postage and packing, please enclose remittance when ordering Other Societies' Events Eric Morgan Thursday 24th April. 7.30pm Finchley Society. Christ Church, High Road, North Finchley N12 (opposite Homebase). 'Finchley to Friern’ Talk and Slide Show by Mike Gee. Refreshments 7.30 pm. Non-members £2. Saturday 3rd May. 2-4pm Myddleton House Gardens Bulls Cross Enfield EN2 9HG 'Walking in the footsteps of Mr Bowles'. An informative tour highlighting the history of the man and his gardens £4 Tuesday 6th May. 1pm Gresham College at Museum of London, 150 London Wall. 'The Gresham Ship. An armed Elizabethan Merchantman recovered from the Thames'. Talk by Dr Gustav Milne. Further details at www.gresham.ac.uk Saturday 10th and Sunday 11th May. 11am to 4pm. National Mills Weekend. Three Mills House Mill, Three Mills Lane, Bromley-by-Bow, E3 3DV. Discover this Grade I listed Mill, the subject of our April lecture. Go to housemill.org.uk for further information. Other Societies' Events (continued) Sunday 11th May. 9.30am -4pm. Lea Valley Walk - Lea Bridge to Three Mills. Experience the industrial heritage and natural history of the south of the Lea Valley. Start at Waterworks Centre, Lammas Road (off Leabridgehead), Leyton E10 7QB Cost £15. Go to field-studies-council.org for further information. Sunday 11th May. 10am. to 6pm RAF Museum, Grahame Park Way, NW5 5LL The HendonModel show, 2014. Commemorating the centenary of the First World War. Static and MotorisedModel displays. For details, visit www.rafmuseum.org/whatson. Also until Wednesday 30th April 'Pilots of the Caribbean.' Volunteers of African Heritage in the RAF. Exhibition with Black Cultural archives. free admission. Monday 12th May. 3pm Barnet Museum and Local History Society. Church House, Wood Street, Barnet (opposite museum) 'Culture Wars: Jewish Immigration to the East End, 1880-1890.' Talk by John Lynch. Wednesday 14th May 7.45pm. Hornsey Historical Society. Union Church Hall, corner Ferme Park Road, Weston Park, N8 9PX 'Treasures in the Tower of London.' Talk by Garry Wykes. Visitors £2. Refreshments before. Thursday 15th May 7pm. London Archaeologist. Institute of Archaeology 31-4 Gordon Square WC1. Annual Lecture on 'The important Roman and Mediaeval Bloomberg Site' Sadie Watson (MOLA) Thursday 15th May 7.30pm. Heath and Hampstead Society St Stephen's Church, Pond Street, NW3 (corner Rosslyn Hill) 'How the Heath was saved.' Talk by Helen Marcus with readings, songs, poetry and pictures. £5 donation at door. Friday 16th May 7pm COLAS St Olave's Parish Hall, Mark Lane EC3 7NB. 'The King's Yard - Archaeological Investigations at Convoys Wharf, Deptford. 2000-2012’ Duncan Hawkins Visitors £2. Refreshments after. Sunday 18th to Sunday 25th May. Barnet Borough Arts Council. The Spires (next to W H Smith) High Street, Barnet. Art and Information exhibition (including HADAS details) Wednesday 21st May. 7.30pm Willesden Local History Society, St Mary's Church Hall Neasden Lane NW6 2TS (near Magistrates' Court) 'Forty years of Willesden's History.' Talk by Irina Porter about the Society's forty years existence since 1974. Thursday 22nd May. 7pm Enfield Society Heritage Walk. Guided walk around Enfield town, to include entrance to the Tudor Room and probably St Andrew's church. Meet in the Market Place. Please send a stamped addressed envelope for tickets to Heritage Walks, Jubilee Hall, 2 Parsonage Lane, Enfield EN2 0AJ Thursday 22nd May. 8pm Pinner Local History Society. Village Hall, Chapel Lane Car Park, Pinner. 'Frustrated Communication - a UK charity. Talk by David Bays preceded by A G M. Other Societies' Events (continued) Wednesday 28th May. 7.45pm Friern Barnet and District Local History Society. North Middlesex Golf Club, The Manor House, Friern Barnet Lane N20. John Donovan Memorial Lecture. 'Life in a Big Company' Talk by Dr Stan Gilks. Preceded by A G M Non-members £2. Refreshments. Thursday 29th May. 8pm Finchley Society. Drawing Room, Avenue House. 'Cinema: Story of the Moving Picture' Talk by Tony Earle. Non-members £2. Refreshments Saturday 24th to Saturday 31st May Finchley Literary Festival. Main event at Avenue House on Saturday 31st May consists of invited speakers discussing/debating 'Women writing as men and men writing as women' and includes book signing and sales by guest authors. Other events including workshops, spoken word, poetry slam, talks and local author book promotions will be held in other venues including two local libraries, two local cafes and a bookshop. Saturdays (various) in May. 'Trinity in May'. Trinity Church Centre, 15 Nether Street N12 7NN. Festival of Arts, Music, Literature and Lots More.